Mariann Lewinsky: Yes, it fitted very well. The diva film was one of the central genres of 1914, and in them the main actresses usually do a kind of catwalk. For example, on the Sangue Bleu DVD which we produced, I asked for skip markers to be put in after every change of costume so that you can skip forward and see all the dresses that Francesca Bertini wears in the film, 18 or 20 of them. The fashion programme was really the fruit of the encounter with the material from the year 1914. Generally, I am free to do what I please. So this year I decided to take the liberty of going a little further back, to see what was before 1914 in terms of fashion. As a result, we have some footage from 1909, and then of course there was the incredible find of the films of Countess Élisabeth Greffulhe [pronounced Greffeuille; the films can be dated to 1900–1904] which is probably the most important footage we have screened this year. Last year I had a hunting film with the King of Spain Alfonso XIII, dating from 1913. It was shot at the Château de Bois-Boudran of Count Greffulhe where everybody used to go hunting, including the King of England. To find family films from the beginning of the century is rare, so I then checked the entire collection. The films were donated to Archives francaises du film by Duc de Gramont – the son of Elaine Greffulhe [Élisabeth’s daughter] and, fortunately, there are no rights issues. There are many hunting films in the collection but then I saw the films with Countess Greffulhe and I cried. MU: Have you come across anything like this before? ML: Early family films are incredibly rare. They are local productions, so there would be only one print made. Commercial production companies like Pathé would release 400 prints and distribute them throughout the world. So you can now find prints in the US, Denmark, Japan… everywhere. Commercial cinema is based on the multiplication of the print that can then be sold. But local productions – and there is a huge amount of that in the history of cinema – are usually made by photographers (this is why I have a suspicion that Nadar, who was the Countess’s good friend, made these films – although I cannot prove it). And of course these family films stay within the families. Lumière was another one who made family films, and these are sometimes screened. So you see the Lumière family – Josephine, the Lumière baby – and once you see a few of these films you start to recognize the whole family. 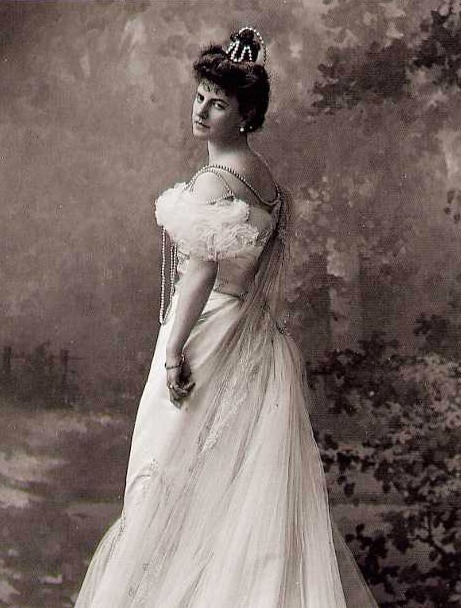 But then, to see the Countess Greffulhe, that’s another thing. Caroline Evans: Did you identify her from other sources? ML: No, the films were identified in this case. 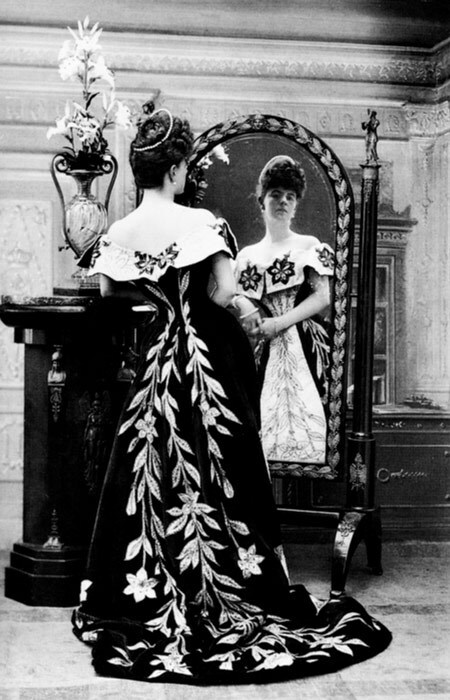 If you go on Google Images, you can also see all these fascinating images of her, wearing couture dresses. Some of these dresses exist. They have been donated to museums; Musée Galliera has several, including a fabulous Worth dress. There are many photographs of her; Nadar himself took quite a few. But to see her move… is to see the movement of the highest aristocracy in France in the 19th century. She’s a salonnière, she is the Duchesse de Guermantes in Proust’s À la recherche du temps perdu. Hers are the kind of movements that still exist in fashion and the beauty world today. These women were the top professionals in wearing fashion; fashion was their profession. They had to know about dresses and, of course, about how to move in them. MU: Who were the other women in the film? ML: The little one was her daughter Élaine and the adult is probably her sister. She is pretty too but not as stunning as the Countess. CE: Are there comparable films you can think of in the same period of other women in motion, especially of women who are not professional performers, such as actresses, models or dancers? ML: You have lots of everyday scenes. But they are not women who are so proficient at wearing fashion. MU: Caroline and I wondered yesterday about when it is that women first became conscious of displaying fashion for the camera, not just being in front of it having a drink or smiling. When did this consciousness of performing fashionability in film come into play? Maybe these films of Countess Greffulhe are part of the answer. ML: Yes, she models, just as she would in everyday life for her tailor or at her soirées, which would in themselves be performances of sorts. There would not be a movement out of place. In the films you’ve seen she is relaxed but she still showcases her set of movements. Of course we don’t know what she would be like when she was alone. By the way, she complained very much about Proust’s behaviour, that he was too forward with praise. CE: What do you mean? That he was sycophantic? MU: What an interesting set! CE: Speaking of decorum, there is quite a bit of historical research on the pedagogy of the body which shows how movement and deportment are taught and how they then become internalized. And if the consciousness of the body was acquired and learned, it is interesting to see historical film of people moving for the camera. Mariann, you often comment on the different ways in which early twentieth-century dancers or models moved, and I wonder if you can elaborate on that. Is there a difference between an aristocratic woman, a bourgeoise woman and an actress or a dancer? ML: Well, I think so. For one, class difference is a huge theme in comedies. If you see Asta Nielsen playing the proletarian girl in Gad’s Vordertreppe – Hintertreppe (Frontstairs and Backstairs, 1915), it becomes clear. This may not relate to your question but you also just made me think of the Ottoman Empire series we’ve had as part of the programme. There are many non-fiction films showing a world in which people are being filmed and they are aware of it. In many of these films there is a clear sense that the camera is there and people are completely relaxed in front of it. Sometimes there are staged scenes. Women wash wool, then look directly at the camera and show a bit of their work and then they go on as before. Vincenzo Maggritti: Talking about the camera look, it’s interesting to note that this kind of consciousness of the camera will soon become the forbidden thing. 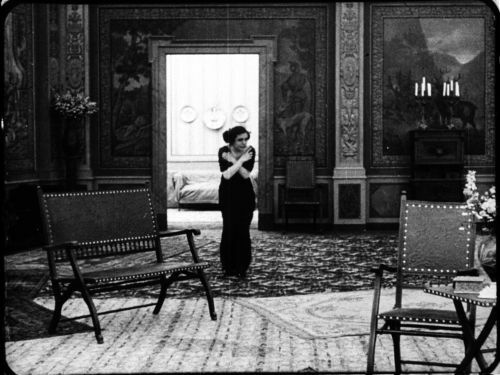 And I see a connection between the awareness of performing and the camera look, which was also traceable in some of the films we have seen, such as Augusto Genina’s Addio, giovinezza! (1918) and Ugo Falena’s Effetti di luce (1916) with Stacia Napierkowska we saw this morning. In Effetti di luce the two women conspire against the husband and let the audience in on the joke – and by doing that they create a triangle. We get this kind of triangular looking in comedies where comics look at each other and then at the camera. But what also struck me was the abundance of smiles on women’s faces while performing. VM: It’s part of the ritual of dance, isn’t it? But in the cinema I think it takes on a different value. ML: Interestingly, there is an ongoing discourse in literature about films from this period. A number of commentators say that actresses are acting more naturally. Funnily enough, this is claimed for nearly all the actresses of the period – so and so is the first one to act naturally… it’s completely ridiculous. Naturalness is not really what we are seeing. Borelli, for example, is very stylised, Napierkowska is not so much an actress but a dancer, and she is also very stylised. The public wanted a performance and the performers were willing to give it. 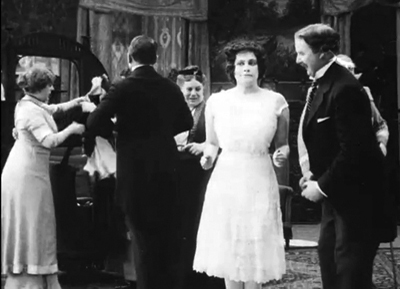 VM: In Maison Fifi (Viggo Larsen, 1914) we saw a contrast between two bodies – the live body and the lifeless dummy. It is interesting because it echoes the discourse of the beginnings of cinema, the notion that the body comes alive with movement… the body is an inherent movement contained in the fashion frame. In this sense, there is a link between fashion and the beginnings of cinema. Elisabeth Lundén: Going back to the films of the countess, there was a definite sense that her consciousness came before the camera, that this kind of performance was all very natural to her. ML: It could be that she was filmed for the first time, and that this made the situation somewhat special for her too. The best performers are of course those who are conscious without you realizing it. And in a way, she does an imitation of herself for the camera. It’s like a whole catalogue of gestures that she has, but which could be toned down in an everyday context. Elif Rongen: Yes, these women are trained to be in the public eye, like actresses today… you know you are being watched as you are getting a coffee from Starbucks… This is what you carry with you the whole time: you are being watched, you have to compose yourself, it becomes second nature. CE: These early twentieth-century women would go to the theatre or the races – all of these were fashionable things to do – and you’d always be on display. But there are differences between aristocratic women posing, and women who mimicked them. ML: It was only today that I realized that the aristocratic women are the prototypes of the actresses. I mean, in the wedding film, countess Greffulhe wears very little, and it is November, so it’s clearly very cold, and everyone else is wearing a fur stole. She has nothing on! Just a tight-fitting golden dress – completely simple – and of course she outshines everybody. It was actually written in the press at the time that she outshone the bride. ER: In the last part of the film she goes onto a balcony and leans over. Maria Jacobini also does this in Tragico convegno (Ivo Illuminati, 1915). And she over-leans in a way that’s not elegant at all. There is something in the way she moves that makes it lumpy. 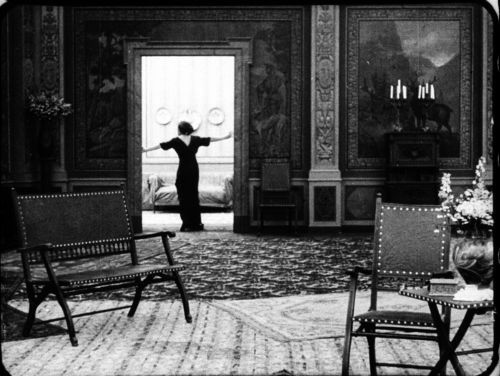 So when you see the Countess, you realize, oh, this is how it’s done – there is a flow and elegance to the act. ML: There are different types of performing for the camera: in one the performer is performing quite directly for the camera; then there are performances not playing to the camera although they are conscious of it being there – and here we have those who remain natural in the camera presence, and those who lose their naturalness, who get embarrassed or freeze up. CE: My question about the types of performance really comes from the knowledge that in upper-class French culture there was a particular sense of deportment, a pedagogy of manners, all of which was a basic part of social life. You’d know how to behave, how to gesture, how to move. So when women voluntarily put themselves in front of the camera, knowing how to behave for the camera, that must be partly a consequence their of social class. ML: Excactly, it was second nature for these women. CE: Yet there are different modes of women performing themseves for the camera. ML: You have good and bad performers. And there are of course patterns of gesturing. You have Lyda Borelli, and then you have all the divas imitating Borelli. She was the template for them. MU: Yes, there was even a term coined for the phenomenon of the Borelli-style performance – borellismo. CE: Many of the fashion models at this time imitated the big gestures of theatre actresses. It is a different style of acting from film acting, of course. ML: What’s interesting is how the film actress shows off her dresses; how she does her ‘catwalk’ in fiction films. When does she open her cape to show what’s inside. The dresses then become part of the art direction. MU: To go back to Napierkowska, do you know anything about her particular connections with couturiers? Did she buy particular couturiers? Are there any known cases of ‘product placement’? ML: The Cine journal that you saw, probably from 1914, of Napierkowska with her dogs (it is a negative so we don’t have any intertitles) must have been an item showing the latest fashions from Paris. CE: Then there was the other one that showed her in medium close-ups; I wondered if one of the dresses was by Paul Poiret. He toured the European capitals with his models in 1911, and his fashions were widely disseminated through department stores and local press. CE: Yes, he actually made his own film in 1911, which he showed on his tour. It doesn’t survive although a lot of journalists wrote about it at the time. ML: And there are other actresses who became known for their love of fashion. Mistinguett was one. ER: Do you know that the archive I work for (EYE Film Institute in the Netherlands) has a lot of these cinemagazines in colour? And what’s interesting is that a lot of these actresses on film resemble fashion models who know how to show off fashion. And a lot of the time we don’t even know the actresses’ names because they are unidentified bits of footage, as in our Bits & Pieces collection. So one should go back and try to identify these. MU: Which is why I think your method, Mariann, that is very much dictated by your 100-years-ago framework, is so useful. Going by the year reveals these gems that nobody else can discover, say, by putting in a keyword such as fashion or hat or a name of an actress or a couturier. I mean, it takes a lot of time and is very impractical, but it’s a great way of finding all these treasures. CE: Do you think you’ll go on researching by years? How many years have you done so far? ML: We started this strand in 1903. CE: So it’s been 11 years now. Can you draw any conclusions about the changes in the female body’s posing, gestures, movements, self-display between 1903 and 1914? ML: If we think about fiction features alone, then the female performer is often a central element to the films. She is certainly one way of making a feature film. With a female body that moves and behaves and is well dressed and beautiful to look at, you can put together a feature film. The usually anonymous actresses in the short films before the arrival of female stardom had a different way of acting, and built a different relationship with the viewing public. They didn’t have to perform second-to-second emotional states, say of a woman who has a destiny and a broken heart: they are more distant. The performance style is more about indications of what is going on rather than living the role: the emotions are not so explicitly expressed and not so embodied. But of course, the public knew how to perform the emotions for themselves, and consequently they built deep relationships with such films. By the way, you must see the Russian actress Vera Yureneva in Woman of Tomorrow [Zhenshchina zavtrashevo dnya, 1914]. ER: She is a completely forgotten actress today as her films do not seem to have survived, but seeing her presence in this film alone makes you realize what an important actress she is. ML: There are some performances that come through… in Woman of Tomorrow it is clearly Yureneva who decides how to move and act, not the director. In contrast, in Sangue bleu the main creative source is the director, Oxilia, not the actress Bertini. Bertini is not a great actress like Borelli or Yureneva. She is certainly beautiful… I mean, everybody has their favourite with the Italian divas – Menichelli, Borelli, Bertini, it’s like chocolate, vanilla and strawberry ice-cream. And it doesn’t matter, it might even be to the advantage of the film that she has limits as an actress, the film is beautiful and beautifully balanced. It’s a director’s film. CE: Yes, like fashion… But what you just said makes me think of the analogies between the materiality of film and the materiality of fashion – these analogies have been made before, by Giuliana Bruno and others. But what the carbon arc projection last night made me realise was that there is also a materiality of projection. It’s not just the film stock itself. And to pursue this analogy further, if film is like fashion, in the now, then maybe digital is a bit like fast fashion. Its not seasonal, it’s about accelerating time in relation to real seasons. And there is a flattening effect with fast fashion linked with globalisation, and perhaps that’s also the case with digitized film. Mariann Lewinsky is a Zurich-based film historian, curator and festival programmer. She has programmed for Il Cinema Ritrovato for over a decade. Caroline Evans is Professor in Fashion History and Theory at Central Saint Martins, University of the Arts London. Marketa Uhlirova is Director of Fashion in Film and a senior research fellow in Fashion History and Theory at Central Saint Martins. Vincenzo Maggitti is a visiting professor of Italian at the University of Stockholm. Elif Rongen is a silent film specialist at Eye Film Institute, Netherlands. Elizabeth Lundén is a PhD candidate at the University of Stockholm.